In a 2-quart baking dish spread refried beans. Top with Red Salsa. In a small bowl combine Greek yogurt and chili powder. Spread mixture over Red Salsa in dish. Top with Green Salsa. 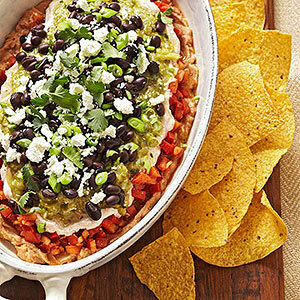 Sprinkle with black beans, green onions, queso fresco, and cilantro. Serve immediately or cover and chill for up to 24 hours. Serve with baked tortilla chips. 1. Brush tomatillos, onion slices, and jalapeno halves with oil. 2. For a charcoal or gas grill, place tomatillos, onion slices, and jalapeno peppers on the grill rack directly over medium heat. Grill, covered, for 10 to 15 minutes or until softened and darkened, turning once halfway through grilling. Or, preheat broiler. Place tomatillos, onion slices, and jalapeno peppers on a broiler pan. Broil 4 to 5 inches from the heat for 8 to 10 minutes or until skins are softened and darkened, turning once. 3. Cool vegetables slightly. Transfer to a food processor. Add cilantro, lime juice, garlic, salt, and black pepper. Cover and process until nearly smooth. 1. In a medium bowl combine tomatoes, sweet pepper, onion, chile pepper, lemon juice, garlic, chili powder, cumin, paprika, and black pepper. This entry was posted in Recipes, Single Mother By Choice and tagged Cooking for Pregnancy and Infertility, Recipes, Single Mother By Choice. Bookmark the permalink.